The music started when Young John Gallagher took the stage before a packed house in Riley’s Outdoor Pavilion. An hour later, The Connolly-Davis Band followed suit before an SRO crowd inside the pub. For the rest of the day, Riley’s delivered a double-track of Irish-trad and Celtic-rock that also featured The Danny McGoo Duo, John Walsh, and The Wild Geese. 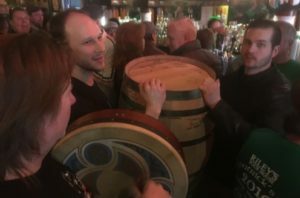 St. Patrick himself even made an appearance (portrayed by Rich O’Malley), as did a freshly distilled barrel of whiskey, courtesy of Ryan Kanto and the newly opened Quantum Spirits of Carnegie. Festivities continued through the night, with the music wrapping up after midnight. Other features included Riley’s new Pour House marker, a bullet-shaped buoy modeled after the Southpoint Buoy that marks the southern edge of the continental United States. 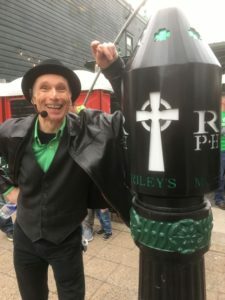 Mounted at the Main Street entrance to Riley’s Gardens, the marker serves to guide the “way to great food, great fun, great memories and a whole lot of craic!” according to pub owner Jim Riley. Displaying the names of all previous Pour House owners and emblazoned with green shamrocks and a white Celtic cross, the marker pays tribute to the Irish community’s long history in Carnegie and beyond. I got a chance to check out the marker during one of our breaks. It’s a beauty. At night, it lights up to serve as a beacon for those huddled masses looking for music, craic, and a perfect pint. Another community highlight for the day centered on the whiskey barrel presented by Quantum Spirits. Taking the stage before our second set, Jim Riley encouraged everyone to to commemorate the day by signing the cask. The last I saw it, it was covered with signatures but still untapped. The day also marked our first performance with drummer Pace Petrella, who performed as if he’d been with us from the beginning. 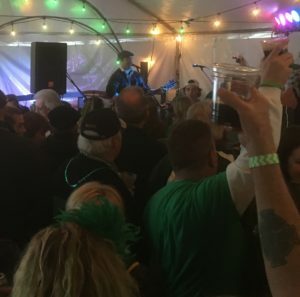 As they did at Riley’s two previous Parade Day celebrations, The Wild Geese provided the grand finale, rocking us into the wee hours with their driving arrangements of Irish standards. I’m ready to do it again. Sláinte! Young John Gallagher opens at noon before a packed crowd in Riley’s Outdoor Pavilion. The 21st Century Scop and the new Riley’s marker. Quantum Spirits of Carnegie presents Riley’s with a signature barrel of whiskey. The Wild Geese Band bring the night to a close in Riley’s Pavilion. This entry was posted on Sunday, March 18th, 2018 at 12:05 pm and is filed under 21st-Century Scop. You can follow any responses to this entry through the RSS 2.0 feed. You can leave a response or trackback from your own site. Powered by WordPress and delivered in 0.285 seconds using 48 queries.